Dynamics Business Solutions - Seite 8 von 9 - Dynamics 365 - Das ERP-System der Zukunft! Wie installiere ich NAV 2018? Wie connecte ich Visual Studio mit der App? Wie erstelle ich eine neue Extension V2? Wie installiere ich eine Extensions V2? Wie veröffentliche ich eine Extensions V2? Let’s prove that with an example. In the next screenshot, I set the key to a different value. Sorry, it’s PowerShell, I only have NAV 2018 installed with docker images. NAV2017 – CU Update installiert, welche Buildnummer habe ich jetzt? Anbei ein Link zur Übersicht. Version 10.0 steht für NAV 2017. Die Nummer die dann folgt steht für die Buildnumber. In Meinem Fall die 18976, diese steht wiederrum für das CU 12 das im November von Microsoft veröffentlicht wurde. Die selben Informationen gibt es natürlich auch für die Version 2016, 2015 usw. Microsoft hält sich daran monatliche Updates herauszubringen. Es ist zu empfehlen diese Regelmäßig zu installieren um damit seine Version auf den aktuellen Stand zu halten und so später mühsame und teure Versionsupgrades zu umgehen. Die neue Version erhält endlich die neue Programierumgebung und die Sprache der Zukunft wird „X“ heißen. I’m just done with the keynote, and have been writing down quite some notes – so I figured, why not turn this into a blogpost ;-). One with a very clear disclaimer: all the below, is how I percieved it, and might deviate from whatever Microsoft was trying to make clear to us. I repeat this every time I write a blog like this: I’m not good at this Marketing and Business sessions like Keynotes. But hey, I try ;-). Full focus for the Cloud! That was a clear message! Microsoft is still all-in. Quotes like “we’ll fully focus on the cloud” .. “we’ll first make sure the experience in the cloud is like it should be, and then …”. Let’s not be surprised about this. Do know though, there was absolutely no indication during the entire keynote, that support for on premise business would disappear – even there was a confirmation that there is no intention to kill off On Premise business. Just – there is a clear focus on what the market wants … cloud! Finally a formal confirmation from Microsoft that our beloved NAV platform in the cloud, called Dynamics 365 today, is going to have FULL NAV functionality! Not only “Financials”, but the full app! Confirmed! I hold you to it, Microsoft ;-). And not only that, you will be able to take your customized solution – as is – to Dynamics 365! Dynamics 365 “Tenerife” enables that. Microsoft still recommends Extensions – obviously – but it is not a full requirement anymore. We’re talking embed apps, and I can imagine limitations will come if you draw that card – so, if possible, let’s do Extensions! Let’s do a true app! But – Microsoft listened – embed apps are going to be possible. CDS is a very key part in whole Microsoft as a company. It’s connecting all these Microsoft products with each other .. through CDS .. For all of this software to work together. .
We have seen a demo during the Keynote, that – I think – kind of like illustrated that. The invoicing app that comes with O365, which you can use on for example an iPhone, where you can create an invoice, which you see in the Business Center in O365, where you have prices that come from D365 Business logic … you know .. Cool stuff. More to come when somebody can wrap their head around it ;-). Basically: Demo Time! Let me quickly go over of what I picked up of it. I understood that the full functionality is basically already there in the preview sandbox – you can simply enable it with the Sandbox Wizard (just search for the page). You can now very simple change role center from the web client, without sign out/sign in. Very simple. Same is for changing companies, by the way. Import data has been improved. Not only master data from quickbooks are imported, but also documents, like sales and purchase invoices, balances, … . It’s very easy to take for example quickbooks customers to D365 Tenerife. New notifications to run more smoothly – we saw an example on Purchase Order, where Yannick punched in a “vendor invoice number” that was already used. New interactions with excel – to “edit” the journal in excel. Even additional lines could be added from within excel. Basically, that’s how accountants like to work! You can give your accountant access to your system by use of a wizard. Very useful for giving your specific accountant access, but it doesn’t stop there – it will also enable you to select from companies in a list, that would be able to provide accounting services for you ..
Yannick also showed that it recognized contact pictures, filling in a profile to recognise gender and age.. . All with Azure Services, which Microsoft is more-and-more consuming. You will be able to personalize your user experience in the client. Not exactly the same as the In-App designer, but not that different. You can add, remove and move parts of fields and quite some more – all for you individually. In 7 seconds, they are able to set up a new tenant, and make a new environment operation for the user. That is “hyper scale“, people! The data-upgrade is about 30 seconds per tenant – this is the time that the system will be offline – but it’s fast! But it obviously depends on the amount of data – don’t know anything about that.. .
As already mentioned – Appsource will be extended to enable consulting offerings! Yep, you read that right! You can define a fixed price offering, on AppSource! These will become available right inside D365 Tenerife. AppSource is there to Build with you, Market with you and Sell with you! Quite the same as personalization, but when you stop the designer, you have the opportunity to save the changes – you can take the changes, and deploy it on a different tenant. It is basically the generated code that you get, that kind of like enables this In-App designer as being a great to for developers as well! Dynamics 365 “Tenerife” will come with about 44 pre-defined API’s, which can be used to connect third-party system to NAV. You don’t really need an NAV background to be able to integrate with it. This was cool to see – but I could have had slightly the wrong picture. Then again – this is what I got out of it. Microsoft has created some kind of “Account Hub” app, on the Dynamics 365 platform, for accountants to connect to their clients. Every single O365 is already running the product .. will have a Dynamics 365 “Tenerife” backend. So they are ready to extend with our apps, our extensions, … . One Demo we have seen, is an integration with the “Booking”-ability in O365, where companies like Hairdressers, who wants the ability to have online appointment registration. And it was going to add this in the O365 calendar – and not only that – it was also visible in a part of some customized part of Dynamics 365 “Tenerife”. Also the data for the Staff-list, and the kind of services, was data that came from the App in Dynamics 365. Also on the Outlook-integration, Microsoft has expanded. We saw a demo where from quote-thru-payment, all was done from Outlook. Company gets email and functionality figures out which document from contact and document number in the mail, and posts invoice and send it. Customer receives a mail with invoice – and “Pay” link. Customer can pay with one of his cards that are linked to his Microsoft account. Wie installiere ich eigentlich das neue NAV2017 CU11 Update? 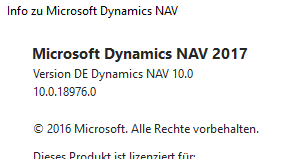 ich habe vor kurzen einen BLOG-Beitrag veröffentlicht (URL)in dem ich auf das NAV 2017 Update CU11 für Microsoft Dynamics NAV 2017 hingewiesen habe. Wir installiere ich dieses Update eigentlich? Was sagt uns der Google Übersetzer dazu? Dieser Artikel beschreibt, wie Sie ein kumulatives Update für Microsoft Dynamics NAV 2017 installieren. Sie müssen alle Objekte neu kompilieren, nachdem Sie ein kumulatives Update installiert haben. Bei einem kumulativen Update handelt es sich um eine kumulative Datei mit allen Hotfixes und behördlichen Features, die für Microsoft Dynamics NAV 2017 veröffentlicht wurden. 1. 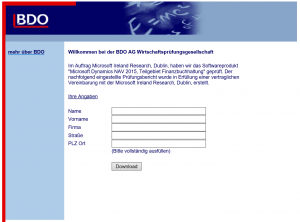 Importieren Sie die CUObjects. . .fob-Datei in eine nicht modifizierte Microsoft Dynamics NAV 2017-Datenbank. 1.Bewegen Sie sich an einer Eingabeaufforderung zum Speicherort von finsql.exe. Standardmäßig befindet sich finsql.exe unter C: \ Programme (x86) \ Microsoft Dynamics NAV \ 100 \ RoleTailored Client \. Alle anderen Parameters sind optional. For more information about the ImportObjects command, see ImportObjects. 1.In the development environment, on the Tools menu, choose Object Designer. 2.On the File menu, choose Import. 3.In the Import Objects window, locate the folder where the import file is located, select the file, and then choose Open. If you import objects from a .txt file, then the objects in the file overwrite any objects that are already in the database. If you import objects from a .fob file and one or more objects in the file has the same ID as an object that are already in the database, then you receive a warning. You can choose to either cancel the import or open the Import Worksheet to resolve the conflicts. 4.Use the Import Worksheet to specify how to resolve conflicts between objects in the import file and objects in the database. For more information, see Import Worksheet. 2. Ersetzen Sie die vorhandenen Objekte in der Datenbank durch die kumulativen Update-Objekte. Weitere Informationen finden Sie unter Gewusst wie: Importieren von Objekten. • Geänderte Datenbanken oder lokale Datenbanken, für die lokale kumulative Updates nicht freigegeben werden: 1.Importieren Sie die CUObjects. . .fob-Datei in das Fenster „Arbeitsblatt importieren“ in Ihrer geänderten Datenbank. Weitere Informationen finden Sie unter Arbeitsblatt importieren. 2. Ersetzen Sie die Objekte in Ihrer Datenbank, die NICHT geändert wurden. 3.Verwenden Sie die Datei CUObjects. . .txt, um die kumulativen Update-Objekte mit den Objekten in Ihrer Datenbank zu vergleichen und zusammenzuführen, die geändert wurden. Sie können auch die Changelog verwenden. . .txt-Datei, um die Änderungen manuell auf die Objekte in Ihrer Datenbank anzuwenden. es gibt mal wieder neues von NAV – könnt ihr alles unter dem Link nachlesen. Installationshinweise können gerne bei mir angefragt werden. Zusammengefasst: Die Zukunft liegt in Extensions und diese Funktionieren sowohl bei NAV2017 OnPremise wie auch bei Dynamics 365 Financals. Die Implementierung ist automatisch Updatefähig. Anbei der Link zum Artikel der FWI.Group. Anbei findet Ihr einen Link zu einer Anleitung von Microsoft wie man die CU Updates einspielt.